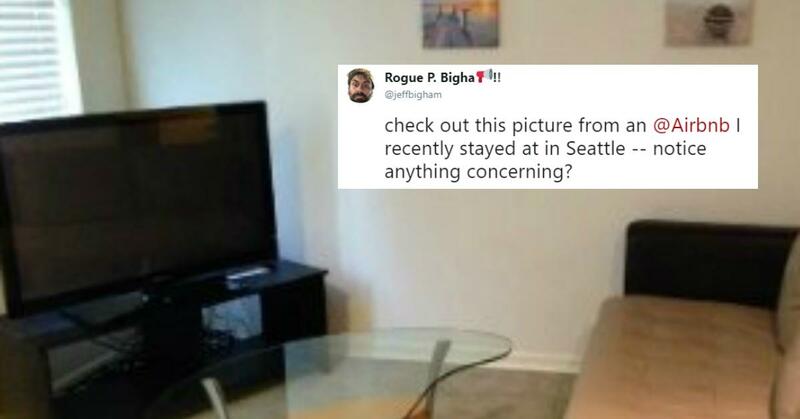 An Airbnb guest recently uploaded a photo of his room and it's freaking out a lot of people online. Horror stories of the occasional awful Airbnb host (and guest) are all over the internet. The most obviously creepy thing that first pops into someone's head is, "oh my God, are there any hidden cameras in this room?" It's a real fear I had when I booked my first Airbnb. Thankfully, it was an awesome experience and we didn't come across any hidden devices, nor did our host give off any weird or scary vibes. I'd like to think the majority of hosts are just looking to make some money by providing a comfortable living situation for another person. 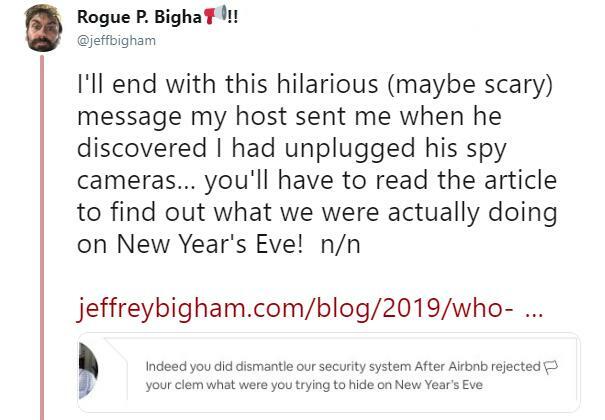 Unfortunately, for Twitter user @jeffbigham, that wasn't the case. His host put a camera in their Airbnb, but that's not the most troubling part of his story. Where it gets really messed up is that the host had uploaded some 20 photos of the room, and one of them included the camera in it — if you looked very closely. 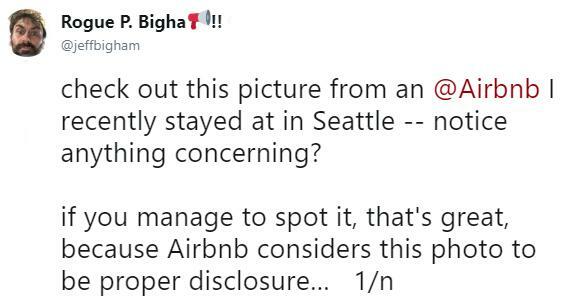 That's the beginning of this incredibly sordid tale that raises all types of questions about the rules and regulations Airbnb hosts must follow. 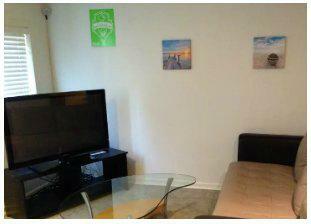 Take a look at the photo he took from Airbnb's site and uploaded to Twitter. Can you spot the camera in it? Because I can't. 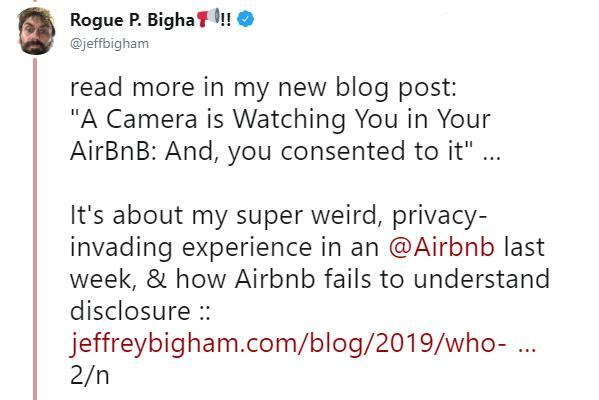 Apparently because the host included a photo of the room with the camera, Airbnb says this is implied consent on his behalf and indicates he was OK with sleeping in a room with a surveillance camera. Jeff blogged and tweeted about his experience and what happened when he reported it to the homesharing app. One would think Airbnb would investigate the matter and offer compensation to the violated guest. But Jeff discovered that he was expected to be "OK" with it due to the host being "upfront" about putting a camera in their room to record guests. Because he didn't read the "terms of service"— and in reality, who does? — Jeff apparently gave consent to being recorded during his stay because the camera is technically visible in one of the 20 photos on the post. 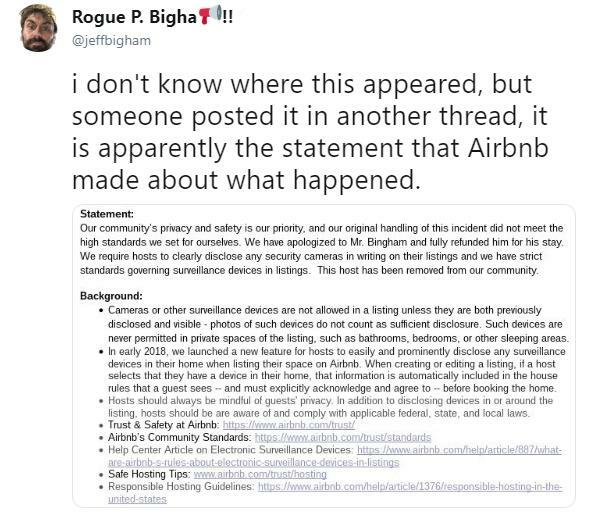 He made sure to include Airbnb in his tweet and voiced his concerns about being forced to read every terms of service for the hospitality platform going forward. Not exactly efficient. If that were the case, personally, I'd much rather just front the difference for booking a hotel room and not worry about whether or not there's a dude recording me at night and uploading my footage to some very niche website where North Jersey-based Eastern European men are a hot commodity. After Airbnb regected Jeff's claim, he took matters into his own hands and hid the camera the host set up in the room. The host's response? He accused Jeff of "trying to hide something." Yeah, just a totally normal thing to say to someone you rented a room to. I get that people are protective of their property, but since you're technically working in the hospitality business, maybe you should try to make guests feel comfortable by giving them some privacy. Just a thought. 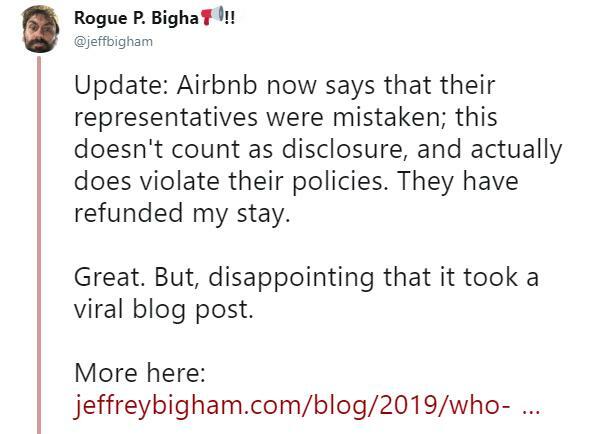 Whether Airbnb investigated the issue further on their own or were encouraged to reconsider based on Jeff's viral tweet and blog post, the company did review the claim and changed their ruling, siding against the host. The renter was ultimately found in violation of company policy and Jeff was given a full refund. For the Carnegie Mellon professor, it wasn't about getting his money back (which is an important gesture on Airbnb's part) but that it took a viral media post and possible bad exposure for Airbnb to take some action. The company also released a statement that cameras and surveillance devices must be explicitly named in the description and bathrooms, bedrooms, and sleeping areas must not have recording devices. Personally, I wouldn't want to stay in an Airbnb with cameras anywhere inside of it. Outdoors, that's fair game, but if I want to walk around the living room completely buck-naked, I should be able to do that without worrying some pervs making fun of my back-fat in another room while eating toaster strudels. Some hosts don't even let their guests know about the cameras they've put up in their rooms. Like this one guest who noticed something strange about a random motion detector on the wall of their room. Or another man who noticed there was something strange about the random alarm clock in the living room of his Airbnb that was pointed right at the couch.